You might think that a vegan quiche recipe would be difficult to find. However, if you use tofu as an egg substitute in quiche, you will find there are actually many delicious ways to make this meal for breakfast, lunch, or dinner. Because the vegan lifestyle eliminates animal products such as eggs, milk, and dairy, it can be tricky to make breakfast fare like quiche. Additionally, if you prefer to have a crust for the quiche, you will need to find a vegan pie crust recipe. Here are a few quick resources for free vegan recipes. The recipe below does not include a crust. Crustless quiche is a great addition to a healthy lifestyle. It is high in protein, low in carbohydrates, filling, and full of vitamins and minerals. It's also a delicious way to get your whole family to enjoy vegan eating. Follow these simple instructions to make a fantastic quiche. Don't feel tied to the asparagus, onions, and mushrooms in this recipe. You can use nearly any vegetable you want. Just follow these steps to create an easy, quick meal for your family. In oil, sauté all vegetables until they are soft and the onions are just turning brown. Remove from heat and allow to cool. Meanwhile, mix all other ingredients together in a food processor. The consistency should be smooth and easy to pour, like that of an egg batter. Combine vegetables and tofu batter. Spray a glass baking dish with nonstick cooking spray. Pour mixture into baking dish, and bake for 27-30 minutes. An inserted toothpick should come away clean when done. 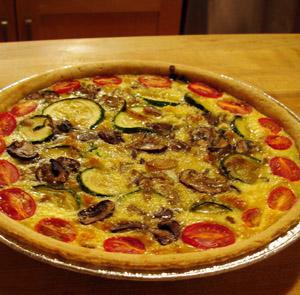 Note: If you are using a pre-made crust for this vegan quiche recipe, simply pour the tofu and vegetable mixture into the crust and bake accordingly. For more great vegan recipes, search online or purchase a all-vegan recipes cookbook.